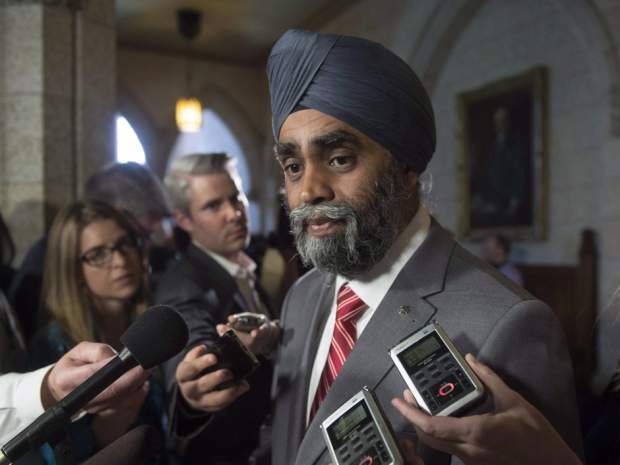 OTTAWA, CANADA— Defence Minister Harjit Sajjan says protecting civilians — by force if needed — will be central to any Canadian peacekeeping mission in Africa, and that Canada will expect troops from partner countries to operate on the same principle. In an interview with The Canadian Press, Sajjan said he is concerned that despite having “robust” mandates and rules of engagement to act, peacekeepers from some countries have failed to intervene in cases where civilians have been attacked. The willingness of prospective partners to act when required is one factor being considered as the Liberal government determines where to send upwards of 600 Canadian soldiers, he added. The comments follow several incidents in South Sudan, including one in July in which peacekeepers failed to respond for hours as local soldiers attacked and raped foreign aid workers at a nearby hotel. Peacekeepers in the Democratic Republic of Congo and Mali have also been accused of not doing enough to protect civilians from attacks by local militias and insurgents. The mandate and rules of engagement for all three peacekeeping missions allow the use of deadly force to protect civilians if needed. Complaints about peacekeepers standing aside while civilians are attacked are not new. The UN’s failure to stop mass atrocities in Bosnia and Rwanda in the 1990s largely prompted western countries such as Canada to move away from peacekeeping. The problems of 20 years ago related to weak mandates and limited rules of engagement from the UN Security Council, says Richard Gowan, a peacekeeping expert at the Center on International Cooperation in New York. But the UN learned from those mistakes, he said. The protection of civilians is front and centre in both mission mandates and the rules of engagement allowing peacekeepers to use force. The problem now is with individual member states. Blame for not responding to the July attack in South Sudan has been largely directed at Chinese, Ethiopian and Nepali troops. The Ethiopian contingent had already been criticized along with those from India and Rwanda for not intervening when violence broke out at a UN camp in February, killing at least 30 people. An investigation by the UN blamed “confusion with respect to command and control and the rules of engagement,” as well as a lack of co-ordination between various peacekeeping units at the time. There have been some suggestions that Canadian troops should answer to Ottawa first and foremost as well, rather than the UN Department of Peacekeeping Operations in New York. But Sajjan pushed back against the idea. Rather, he said, the government has been talking with other countries about making sure the UN force commanders on the ground have the flexibility to be able to make quick decisions and protect civilians without having to check with national capitals. Sajjan’s comments are part of a push by western countries to eliminate caveats and make sure all peacekeeping countries are willing and able to do what’s necessary to protect civilians, said Gowan. But no matter what, Canada will need some type of contingency plan to make sure the troops are supported in a dangerous situation, he said.